Rock City Grill owner Jim Rhoades and manager Chelsea Moore. Imagining Spokane's food scene without pizza is nearly impossible, given the recent explosion of pizza joints in the city, but when Jim and Rose Rhoades opened Rock City Grill in 1992, pizza is exactly what they thought Spokane was missing. "We fell in love with this gourmet-ingredients-on-wood-fired, thin-crust pizza concept in 1990," says Jim Rhoades. "Back then people were saying 'Wait, we already have pizza here,' but they were talking about places like Domino's." Rock City moved from the corner of Riverside and Stevens to a more spacious spot in River Park Square in 2003. A remodel in 2014, intended to emphasize the Blue Martini Bar, changed the atmosphere of Rock City more than Rhoades expected. "The remodel turned out beautifully, but it might've made us seem too upscale and scared away some of our family business," says Rhoades. "We've always been casual dining, and we're back to that now." As regulars at South Hill restaurants, Rhoades and his wife felt it was time to move from downtown to the South Hill. The new spot, formerly Famous Ed's, offers a slightly smaller food menu of the same pasta, burgers, salads and pizzas — including the Thai pizza, of course. The familiar Blue Martini Bar neon sign is up, and an outside deck provides outdoor seating that Rhoades says has been crowded since they opened. With many of Rock City's customers previously traveling from the South Hill to downtown for a martini or pizza, the new location not only cuts down on the drive time, but also has free parking. 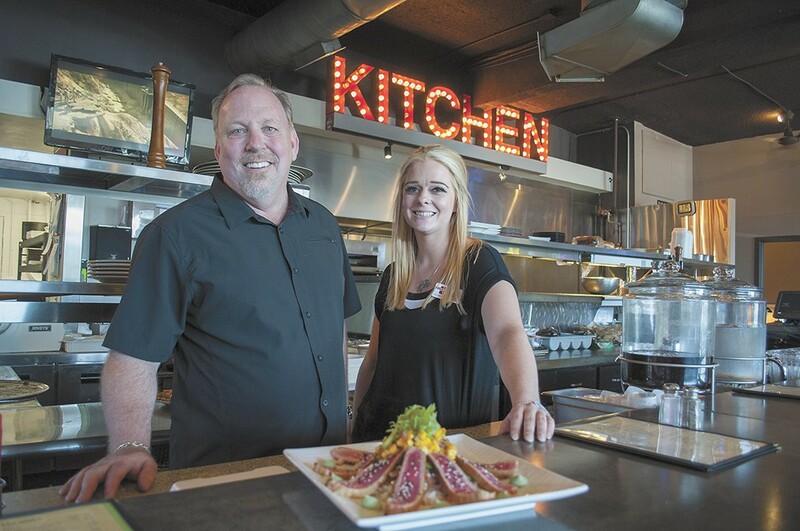 Now settled in the South Hill spot, Rhoades is glad that Rock City's previous location will be home to the second location of Tomato Street — another local restaurant owned by a husband-and-wife duo.